The processes involved in airflow connected with supersonic flight have been a problem for aerospace engineers for decades. It was working out how to cope with the shockwave of exceeding the speed of sound that was the sticking point for designing the first supersonic aircraft. Today, the difficulty comes more with modelling what happens inside an engine that propels aircraft at supersonic speeds. In a jet engine, air flow is slowed down to increase the temperature and pressure for combustion to ensure that the correct ratio of fuel to air is maintained to optimise thrust and acceleration. In supersonic engines, the situation is even more complicated, with supersonic shockwaves creating turbulent flow inside the engine with vortices that change the way fuel combusts and multiplies the number of possibilities for the way the particles can behave. 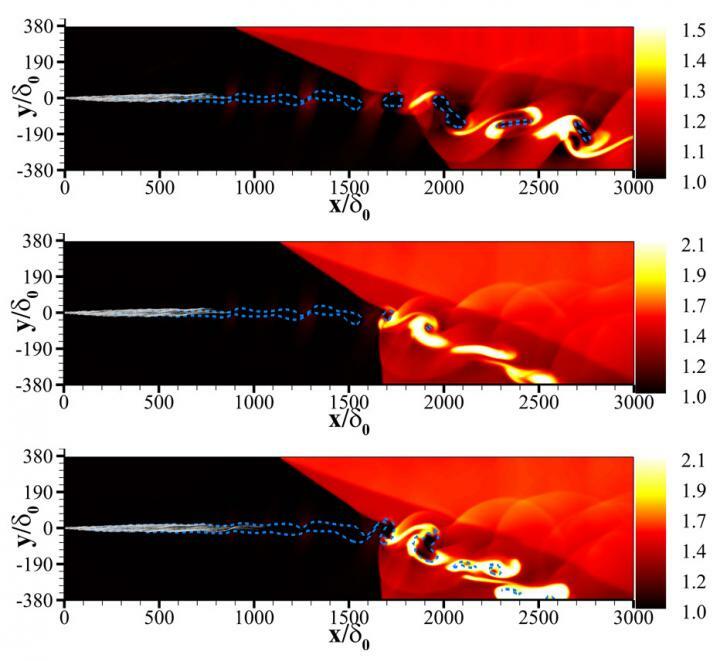 In the study, Wang and colleagues from the school of power and energy at Northwestern Polytechnic University in Xi’an describe how they used customised simulation codes and the mathematical technique called the Eulerian-Lagrangian method to characterise the influence of a shockwave striking the engine at an oblique angle, tracing out large-scale shearing vortices and exothermic reactions, mathematically mapping the influence of variables and the resulting types of waves in a shocked gas. A particular result of the analysis was that there are two induced combustion modes, due to the formation of a reflected wave coupled with the chemical reaction inside the engine. This allowed them to see how changing variables such as the fuel load and intensity of shockwaves changes the characteristics of combustion and, they believe, will help in the design of future scramjet engines.